"FRC combines the excitement of sport with the rigors of science and technology. 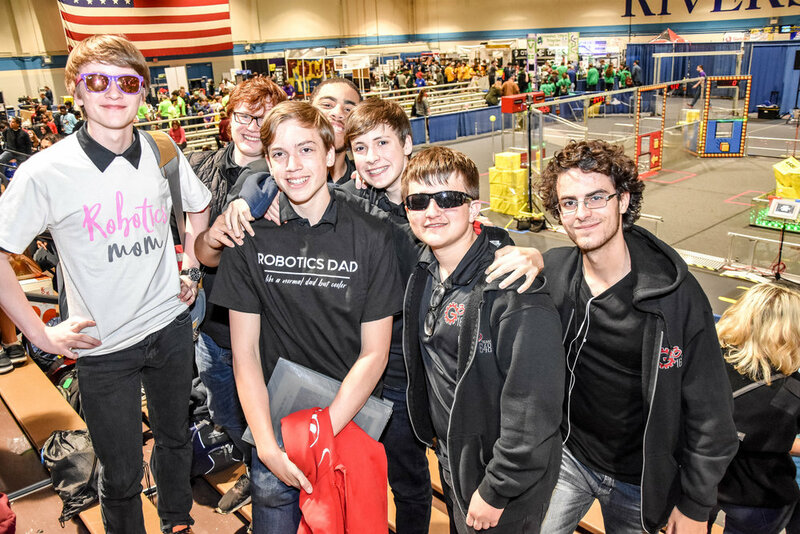 Under strict rules, limited resources, and time limits, teams of 25 students or more are challenged to raise funds, design a team "brand," hone teamwork skills, and build and program robots to perform prescribed tasks against a field of competitors." During the spring, our team participates in a competition called FIRST (For Inspiration and Recognition in Science and Technology) Robotics Competition, or FRC. Each year there is a new game released for the robots to participate in. After the game is released, we have six weeks to design and build a robot roughly the size of a refrigerator. FIRST gives us a general kit of parts to use when building the robot and we have the ability to buy extraneous parts to build with and to specialize the robot. During the game, teams are randomly assigned to alliances of three, and these alliances have 2 minutes in each match to score points. After the qualifying rounds the top 8 teams choose their alliances for the finals. After the 8 teams compete in a series of double elimination rounds, the winning alliance of the regional is determined. The FRC competition also includes the Chairman’s Award. The Chairman's award is a competition that recognizes the FRC teams' ability to spread the FIRST message throughout their community. For more information, visit usFIRST.org/frc.